You made the right choice, Welcome! The Disability Achievement Center is the best stop for your personal achievement goals. If living, learning, working and playing as independently as you choose are your goals then we are here to bring you all the choices you need. Since 1992, Disability Achievement Center has been serving people of all ages with disabilities in Pinellas and Pasco Counties. We are a consumer driven 501(c)3 not for profit resource center that serves people with all types of disabilities and their families at all stages of life. We are constantly growing, changing and seeking new ways to support your achievement. We are all about practical, person centered achievement that puts your goals front and center through empowerment. Respect, Choice, change are our core values. Respect for your goals. Offering all the choices you need to achieve, and change through your goals. It is all waiting for you to act by calling, clicking or coming in to visit the achievement team. We are waiting, where are you? We have the answers to your questions and provide guidance to community resources. We offer individual and group training that enables you to live independently. We encourage and facilitate sharing knowledge among individuals with similar life experiences. We provide Individual Advocacy resources which include assisting persons with understanding the community and state services available and helping individuals determine how to gain access to such services that may be needed to help them gain or maintain community independence. Throughout its history the Center has played an active part in systemic advocacy at the local, state and national levels. It has lead the way on issues as diverse as adaptive accessible technology, education, employment, healthcare, transition, transportation, and voting. Often times, the personal self advocacy of a consumer points the way for systemic advocacy. The Center facilitates the transition of people with disabilities from nursing homes, hospitals, and other institutions to home and community based living, as well as the transition of youth with disabilities to higher education, the workforce and/or the community. This includes Diversion services that assist those who are at risk of entering an institutional setting. Centers for Independent Living (CILs) empower persons with disabilities to take charge of their lives and guide their own destinies, maximizing independence. CIL staff and consumers work together to remove barriers and prejudices in society so that all individuals can live and work and enjoy all that their communities have to offer. Fifty-one percent of the staff and boards of CILs are persons with disabilities; we are who we serve. 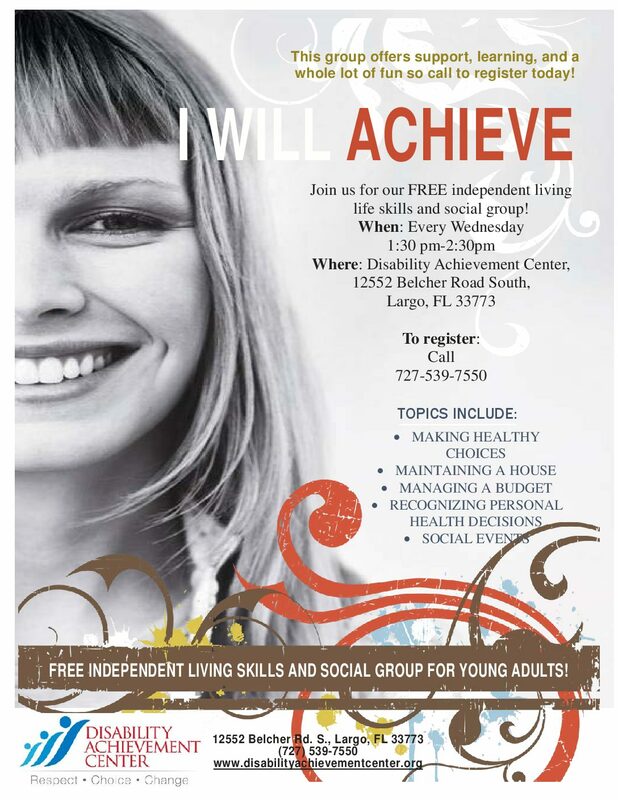 The Florida network of 15 Centers for Independent Living serve persons with all types of disabilities. CILs serve all ages from children to seniors. Every Florida county is served by this network, both urban and rural areas. CILs are federally mandated under Section 725 of the 1973 Rehabilitation Act as amended in 1998. They are funded with Federal Department of Health & Human Services, Florida Division of Vocational Rehabilitation, grants and private donations. CILs are represented through the Florida Association of Centers for Independent Living (FACIL) as an advocacy and support organization. To learn more about CILs click here. We're here to help YOU! Contact us today! Your financial support allows us to work with individuals with disabilities and facilitate opportunities for them to become truly empowered. Donations are welcome and tax deductible. Make Disability Achievement Center Your Amazon Smile Charity!